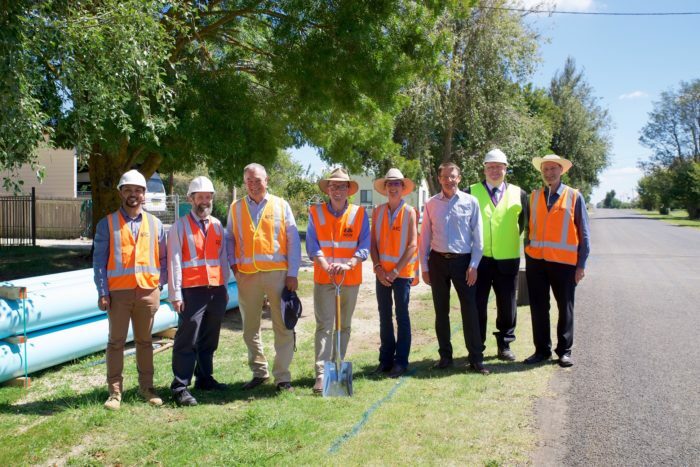 Celebrating the start of construction on the Malpas Dam to Guyra Water Pipeline today, Armidale Regional Council’s Manish Khadgi, left, Luke Finnegan, Mayor Simon Murray, Northern Tablelands MP Adam Marshall, Councillor Libby Martin, Scot MacDonald MLC, Lyndsay Woodland and Ralf Stoeckeler. THE Guyra township’s water woes will soon be in the past with the ceremonial first sod of soil turned today by Northern Tablelands MP Adam Marshall and Armidale Regional Council Mayor Simon Murray to commence construction of the $13 million water pipeline from Malpas Dam to Guyra. A thrilled Mr Marshall, who has been lobbying for the silver bullet solution for two years, said the new 15 kilometre pipeline and associated water treatment infrastructure at Guyra would permanently drought-proof the community and ensure continued growth in the region. “This pipeline will singlehandedly solve Guyra’s water security and quality issues for good and I couldn’t be happier for everyone in the community – it’s an historic day for Guyra!” Mr Marshall said. “With low rainfall threatening to leave Guyra dry in recent years, it was clear that action had to be taken to allow the community to continue to grow and its substantial horticultural industry to expand. Guyra uses an average 423 megalitres of water each year, with demand steadily increasing, which far exceeds the town’s current storage capacity of 277 megalitres. The pipeline will expand that capacity to more than 740 megalitres, exceeding anticipated growth over the next 30 years. Mr Marshall said discoloured, foul smelling and poor quality potable water from the local water supply at Guyra had been an ongoing issue for local residents and would also be resolved with the pipeline and new water treatment facilities. “This problem arises every time the town’s storage levels fall and with Guyra using far more water than is available in storage, this risked becoming a regular occurrence without immediate intervention,” he said. “But the pipeline and the construction of a new treatment plant to replace the old one will permanently resolve those issues. This will not only benefit every resident who uses town water, but also help provide infinite capacity for Guyra’s expanding horticultural industry. “This project is critical to unlocking Guyra’s growth potential and I thank the community and council for its incredibly strong support for this project. Mr Marshall said Armidale Regional Council estimated the pipeline would be completed within six months, with further pump station and water treatment facility upgrade works to follow. The NSW Government provided $12.375 million to council to undertake the project.